Montreal steak spice is a versatile meat or poultry rub that is easy to make yourself from common herbs and spices. There are many homemade recipes for this classic meat rub mix, and chances are that no matter which basic recipe you start with, you will tailor the mix to suit your own taste. That is exactly how I made this copycat version of Montreal Steak Spice; it’s a savory blend with lots of robust flavor notes that aren’t too hot or flowery. Don’t be afraid to make it your own by leaving out spices that don’t appeal to you, or adding more of what you like. About two cups (enough to fill a one-pint jar). Place all ingredients in the blender and grind briefly until seeds are broken up. Grind each ingredient, using a mortar and pestle, or a grinder, until all seeds, herbs, spices and salt are of desired coarseness. Mix all ingredients together and store. Store Montreal steak spice in an airtight container, in a cool, dark place such as pantry. For homemade gifts, store mix in a canning jar or a glass shaker jar. Make sure the shaker jar is sealed (these jars, with perforated shaker lids, usually have an inner plastic lid to keep the contents dry and prevent them from escaping; if not, be sure to seal the top with plastic wrap or foil before screwing on the lid. 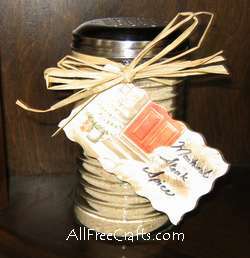 If desired, tie raffia around the neck of the jar and tie in a bow, or use the raffia to attach a jar label. For Steaks: Shake or rub on both sides of steak, preferably an hour or so before grilling to allow flavors to penetrate meat. Other Uses: Shake or rub on pork, chicken, turkey or hamburger before cooking. Toss potatoes in olive oil and sprinkle with Montreal steak spice before roasting or try it sprinkled on baked beans. Combine 1/2 cup extra virgin olive oil, 2 tbsps soy sauce, 2 tsps minced garlic, and 3 tbsps Montreal steak spice. Combine ingredients in flat dish. Rub steaks with Montreal steak spice, then place steaks in marinade for at least an hour to overnight. You can also use this recipe for beef or pork kebabs. Discard any leftover marinade. It is widely believed that an employee of Schwartz’s deli in Montreal first devised the use of Montreal Steak Spice (also known as Canadian Steak Spice) during the 1940s and 1950s, when he began flavoring his grilled ribs and steaks with the deli’s Montreal smoked meat pickling spices. » What is Montreal Steak Spice?